Many manufacturers issue battle sets including older sets of figures along with something new, and this is just such a product. Previous such sets from Strelets have had three old sets plus one new one, but here there are only two old sets and two brand new ones. The old sets, Russian Hussars and Saxon Garde du Corps, have been reviewed before so we will not comment further on them here, concentrating entirely on the two new sets instead. The blue pieces pictured above are of French cuirassiers, and they are real beauties. The Strelets chunky style fits these large armoured men very well, and the detail is really nicely done. At this scale the cuirassier uniform was largely unchanged for the whole imperial Napoleonic period, and these figures display it entirely accurately. All have the plume on their helmets, which was often removed before battle, so some may wish to remove these with a knife. The officer's plume is considerably larger, which is perhaps a sign of his vanity and therefore appropriate. Strelets gained a name for dramatic and even wild poses with some of their earlier cavalry sets, but we felt the cuirassiers here have rather gone too far in the other direction. All the poses are fine but only one is waving his sword in the air and we would have liked a bit more life in some of them. The horses are all properly saddled and harnessed, but again are fairly relaxed (and therefore in keeping with their riders) when at least one full charge animal would have been nice. Cuirassier horses were supposed to be very large (to take so much weight), but in reality supply difficulties meant many were not particularly large, and the horses in this set seem to fit this latter category, which is not a problem. The men fit the horses pretty well and tightly enough to not require gluing. 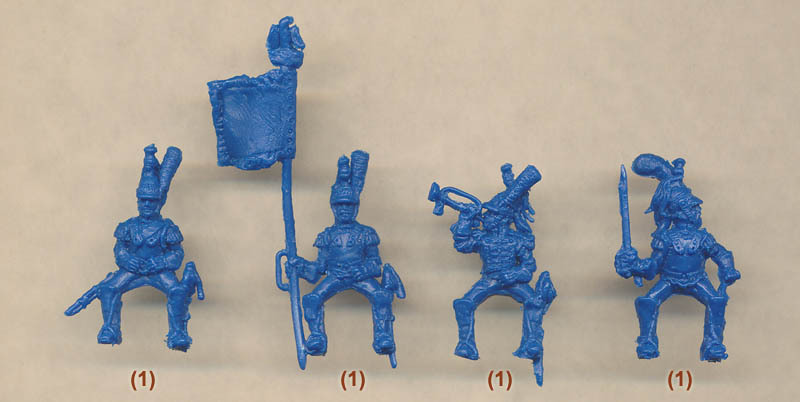 The green figures are the new Russians - dragoons. As with the French these are correctly uniformed for the 1812 date, with the horsehair crest that replaced the 'caterpillar' from 1808. In addition to the sabre all are armed with musket and bayonet, and the officer is resplendent in his sash and epaulettes. One problem however is the Russian standard, which is about 50% too big. We felt that the Russian poses were better than those of the French, with more action, by which we mean waving of swords in the air, although there is still room for men who might be on patrol. As with the French there are no figures with ring hands and separate weapons, but still we liked these poses a lot. While we liked the Russian poses more we were less impressed by the general level of sculpting. While it is by no means bad it does not have the same crispness that is to be found in the French, and perhaps the chunky feel is less appealing on what is basically medium cavalry. Detail is also occasionally missing and the overall feel is of a good Strelets set but still some way behind the best on the market today. These are still very useable figures however and they depict a subject and time frame not previously delivered (those from HaT being for the 1803-1808 period). Again as with the French the Russian horses are well suited to their riders, which means they are more active and with more apparent urgency. Some of the Strelets unlikely poses are to be seen once again but many are OK and the mix allows a wide range of scenarios. In conclusion this is a set that is not without its charm. The cuirassiers are very nice and will please many that have been calling for bigger more stocky figures for this important cavalry type, while the dragoons are not particularly attractive but fill yet another hole in the range of Napoleonic cavalry available in the hobby. Doubtless sales will depend to some extent on how much customers are prepared to pay a premium for sets they may already own, and as a whole this box tells us nothing about Borodino itself as it contains only cavalry, but we hope to see more of the work of the cuirassiers' sculptor so long as more action can be added, particularly for units such as heavy cavalry whose main purpose in life was the decisive charge.